Wall Mount Bike Racks Raleigh. Space bikes just 12″ apart, Easy to use, Locking, Complimentary Bike Room Layouts, Generates Revenue, Free delivery. #42488 Wall Mount vertical bike racks have been designed to create space efficient, Easy to use bike rooms. Manufactured with cushion coated powder coat steel in a medium gloss powder coat finish. 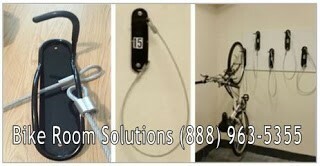 Attached to each #42488 is a five foot long cushion coated security cable that can be wrapped around the bike frame, Both rims and secured with the bike owners lock. Wall Mount Bike Racks Raleigh. Store bikes just 12″ apart, Easy to use. Free Bike Room Layouts. Our Bike Room Specialist provide code compliant Complimentary Bike Room Layouts daily. With the free bike room layout we include several suggestions on how to set up a self managed, Maintenance free bike room. If the bike room walls are sheet rock, We suggest adding plywood supports over the bike walls. 22″ high x 2″ thick for secure anchoring. Prior to installing the bike brackets consider painting the walls in a matte or semi gloss finish for easy removal of dirt marks with a wet cloth. 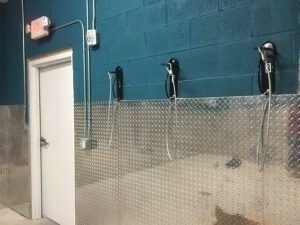 Or add aluminum tread plate under the brackets for an awesome looking bike room. See our pictures. Wall Mount Bike Racks Raleigh. Wall Mount Bike Racks Raleigh generate revenue. Today most developers, landlords, Condo, Town hoards and apartment complexes charge a monthly rental fee for bike room storage ranging from $10.00 to $15.00 per month. 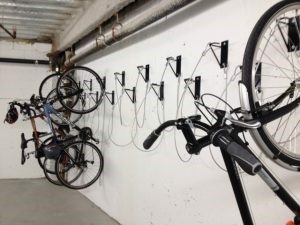 A bike room with 60 bike spaces being rented out for $10.00 per month will generate $7,200.00 in Revenue. The Bike Room will pay for itself within 6-7 months on average, (ROI). Wall Mount Bike Racks Raleigh. Alternate the bike bracket heights when space is tight, So the handlebars don’t touch other bikes. Wall Mount Bike Racks Raleigh, Wall Mount Bike Racks Raleigh NC, Wall Mount bike Brackets Raleigh NC, Bike Hangers Raleigh, Wall Mount Vertical Bike Racks North Carolina. Wall Mount Bike Racks delivered daily to Raleigh NC, Charlotte, Greensboro, Winston-Salem, Durham, Fayetteville, Cary, Wilmington, North Carolina. Bike Hangers RaleighWall Mount bike Brackets Raleigh NCWall Mount Bike Racks RaleighWall Mount Bike Racks Raleigh NCWall Mount Vertical Bike Racks North Carolina.